The school year is almost over and we've accomplished more than I thought possible. 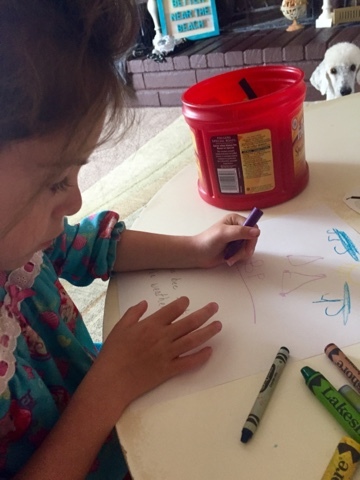 Tiny B taught herself how to eat and both kiddos just bloomed academically and socially. Tiny B has four weeks more for her stoma (feeding tube hole in her tummy) to close before she'll require surgery. It's more complicated than we had thought, but this girl has been through big surgeries and is so brave...She'll be okay if it has to happen. Of course we are praying that it will simply close on its own! It's the final chapter of The Tube and we are ready to close that book for good. I thought it would be good for me to detail one lesson instead of going over many in one blog post, like I usually do. 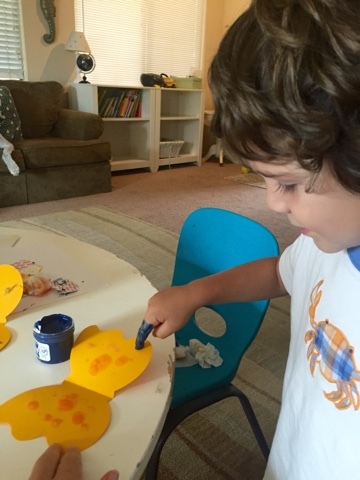 For each day, Mother Goose Time (MGT) gives four different activities and they basically tell you exactly what to do. You can change it if you'd like, or simplify or make it more challenging. In fact, they often give you ideas as to how to do this! I followed this lesson exactly as it's written, and this is what I typically do. I love the natural way that MGT lays out their lessons. 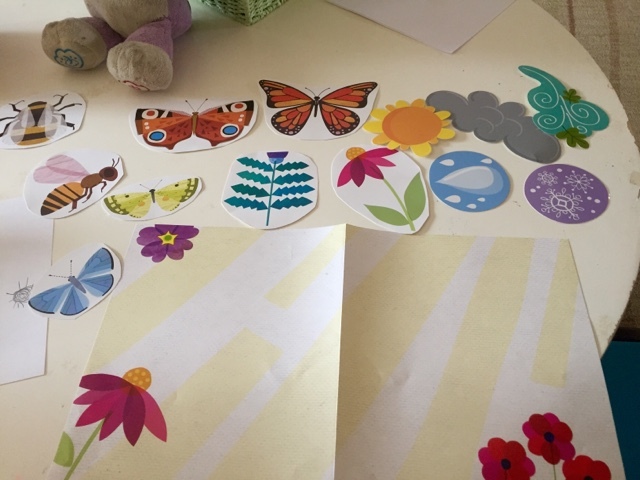 Our lesson was about butterflies and weather. I retrieved my weather pieces that come with the Circle Time tools and I cut apart the storytelling set given to me in the day's bag. I also set crayons and paper in front of my kiddos. I began by asking them their favorite type of weather. Tiny B said that she likes rain and Strong B said he likes sun. I then had them draw their favorite weather. Strong B drew crocodiles. When I tried to redirect him, he wasn't having that, so I just let him continue with his crocodiles. 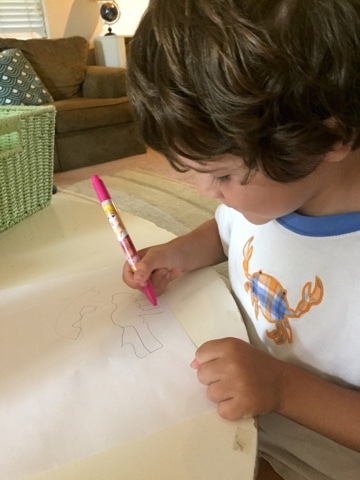 He's three and can't sit for long periods of time, so I really want to just encourage him to love learning right now. That is my goal. 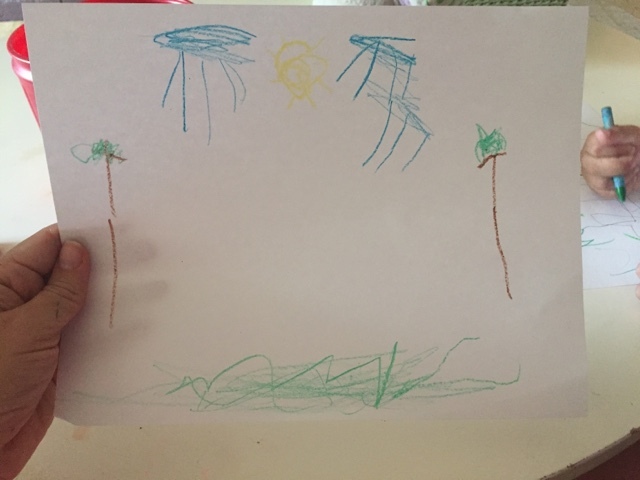 Tiny B drew her rain and trees. She is a very willing student. 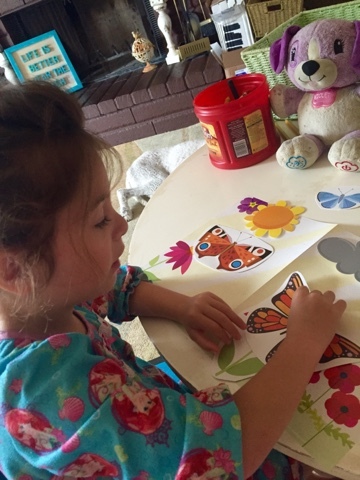 In her IEP meeting this week, her specialists went on and on about how hard she tries and how she is always paying attention during speech and occupations therapy and the one half day that she attends transitional kindergarten. 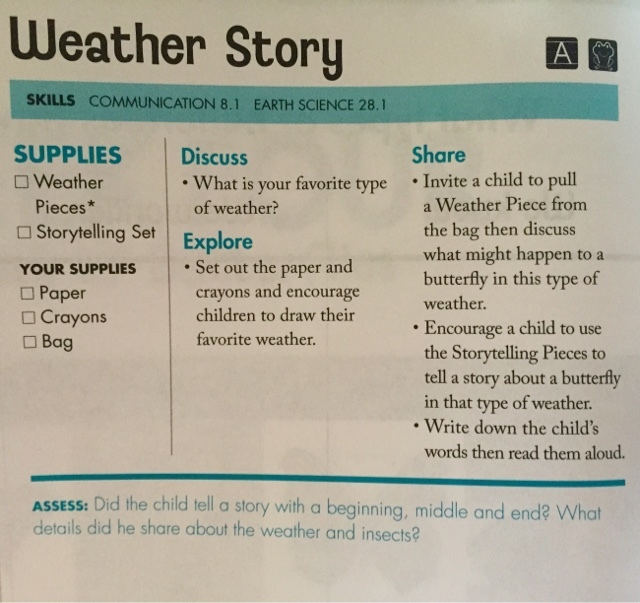 I had the kids each pull a weather piece from a pile and describe what would happen to a butterfly in that type of weather. Strong B drew the snow piece and said that the snow would bury the butterfly. I was really impressed with this! 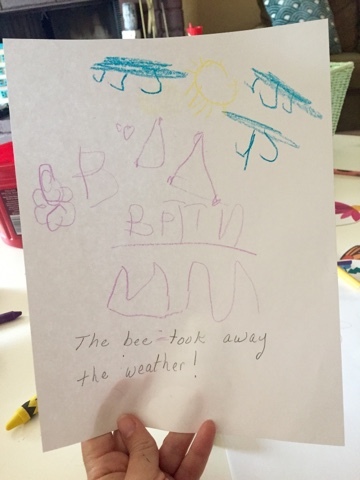 Tiny B drew the rain piece and said that the butterfly would get wet. We talked more about the possible scenarios. They took turns telling a story about a butterfly in different weather. Tiny B loves storytelling and perhaps hearing the sound of her own voice...and her story was long, didn't make much sense, and was absolutely adorable. She was just so excited with the story pieces and didn't want to give them up to her brother. The "assess" portion of the lesson made me ask myself if there was a beginning, middle, and an end to the story, and the answer was that there was a beginning and a middle but not much of an end. It just went and went and went...This is common with 5 year-olds and we will definitely be working on this. I love any type of assessment, whether formative (quizzes, anecdotal notes, questions to ask yourself such as what MGT asked) or summative (end of the year tests, final tests, state tests) because it really guides teachers/parents in what they need to teach next. 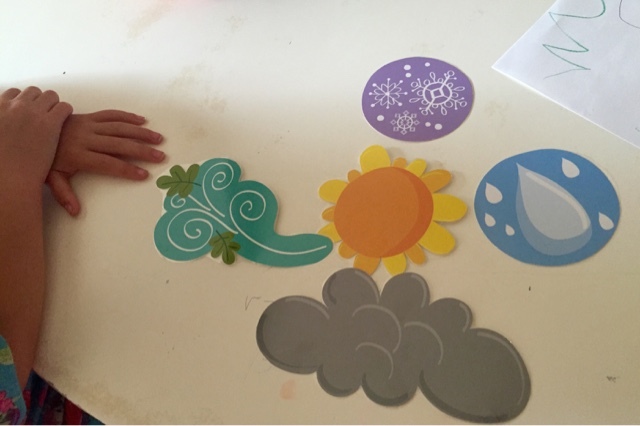 This simple suggestion from MGT will truly help to guide our future storytelling sessions! 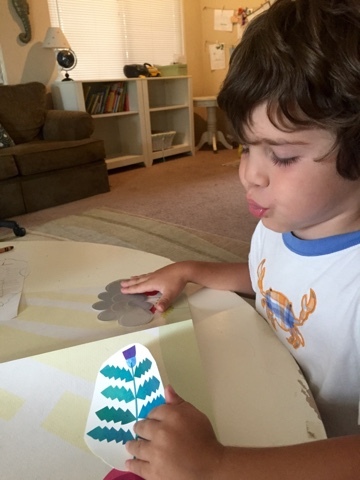 Strong B told a very short story about a butterfly, weather, and a fart. 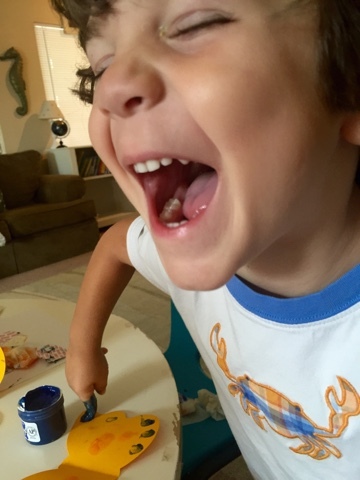 I love 3 year-old boys for reasons such as this. Never a dull moment! I wish that I could show you his smiling face as he told his story! Unfortunately I'm not doing front face pictures in my blog, but just imagine him grinning ear to ear! His story also lacked an ending. This is his fart face. 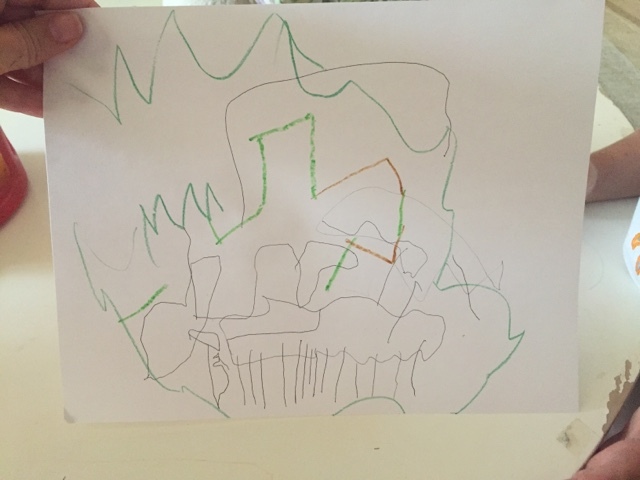 After the fart story, Strong B had had enough and I had Tiny B draw a scene from her story and describe that scene in a sentence, and I wrote that sentence down for her. Look how beautiful the storytelling pieces are. I adore this part of the MGT curriculum. Storytelling is a place where Tiny B really shines. I intended to stop the day's lessons there and not do the craft, but they both insisted on doing it. 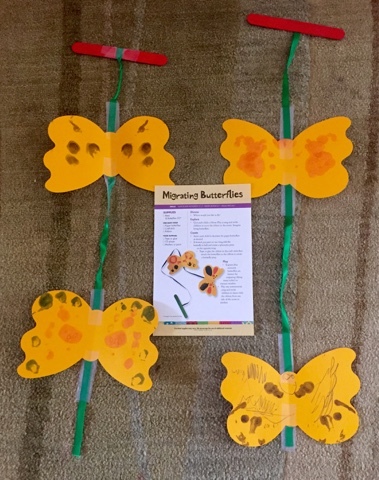 So we did the Migrating Butterflies craft. Tiny B recognized "migrating" yesterday which shows that it really stuck with her. We discussed symmetry (a very hard mathematical concept!) and fingerpainted one side of the butterfly and folded it over so that the exact image would be symmetrical on the other side. I think this look sums up how Strong B feels when doing MGT lessons...PURE JOY!!! !